Solar Panel Hot Spot Exposed! Solar Review. Home Learn Solar Panel Hot Spot (Tier-1) Exposed! 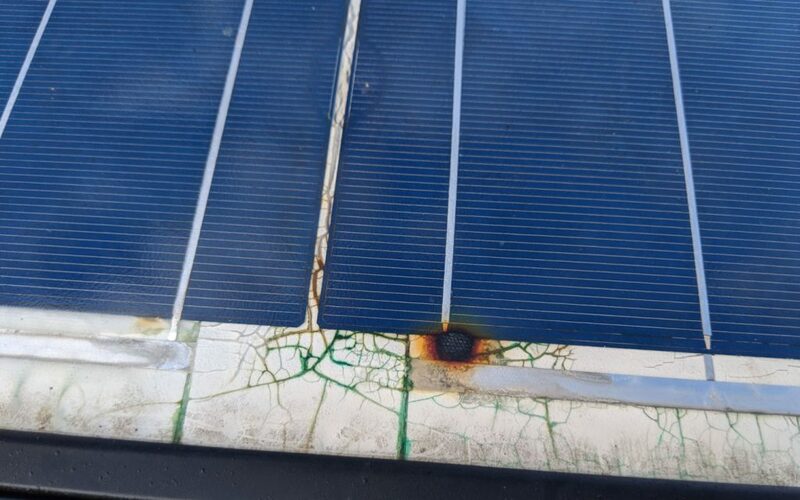 You have the power to prevent such nasty defects in the form of solar panel hot spots from occurring in the first place. In fact, it’s the greatest power of all. The power of choice. What may be less than expected selection criteria most definitely does not include the term Tier-1. Some would describe solar panel hot spot as insignificant blemishes which occur in common solar modules. Common is potentially a better word for cheap. Considering the information you will discover below, you’ll be better equiped with the information to determine whether solar panel hotpot is insignificant or or a critical instability. The extreme side effects caused by solar panel hot spot will present some of the most devastating consequences for any system owner. A varied array of causes facilitate the solar panel hot spot effects to occur. Never fear as there are many things an end user can do to prevent such issues. Before prevention can successfully be achieved, it’s alway best to understand a little about the obvious causes without getting over technical. Damage toward the internal components of the solar module is often a result of mishandling during manufacture, transportation or installation. Such internal damage can cause micro cracks and hot spots over time. Alternative internal failures can be a result of cell material defects, contamination, high circuit resistance, cell fractures, poor solder joints, local delimitation and more. An occurrence by when cells of varying current are connected in series which can often be mitigated via the solar panels bypass diodes.Essentially, cells of higher current are trying to push more energy through other cells down the line which are of limited capacity. None-the-less ensuring cells of equally matched current is essential to avoiding solar panel hot spot. Soiling is foreign matter resting directly on the surface of the solar module, obstructing the cell from direct rays of light. 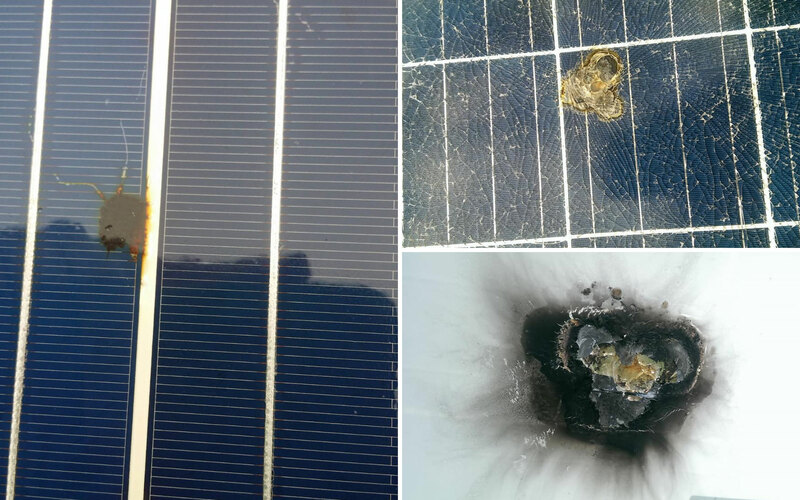 Surface fouling of is the most addressable issue to prevent solar panel micro cracks. Frequent system maintenance will address common soiling issues. A comprehensive assessment of the proposed environment for the module installation should be performed in line with scheduled maintenance. The effects of environmental impact can most certainly be lessened during the process of designing the system. The most common environmental factor which can cause hot spot is shading affecting the series circuit. A detailed site evaluation should be done to ascertain the effects of objects that may shade the solar panel throughout the day and year. Weaker product selection for more extreme environments will also induce the effects of solar panel hot spot. To guide against such, it’s advised to study the environment before choosing the right module for the installation site. For instance, if the assessment reveals that such a location is prone to extreme winds and hail storms, solar panels that have been tried and tested to withstand such conditions must be selected. As you will see, the side effects of solar panel hot spot range from minor through to extreme within only a few stages. In fact, the hot spot is now a visual effect of severely high levels of cell or circuit resistance. Resistance within a solar panel circuit is essentially the same as busy Freeway/ Highway at peak hour. Less resistance ensures the electrons can get where they need to go faster and ultimately work better for you, producing more power. 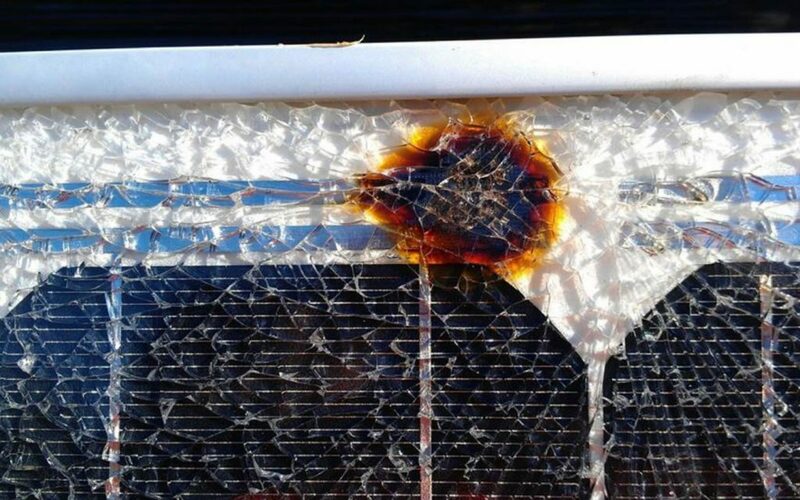 Many protective glass breakages are actually the result of solar panel hot spot and not impact. Glass is often very telling of where the shatter point occured. Once a solar module is shattered the system will likely shutdown as moisture begins to affect the electrical circuit. In most instances the solar panel hot spot itself doesn’t induce the earth fault (critical system failure). Moisture penetrating the solar circuit does. A result after the solar panels protective layers have been damaged. Selecting a solar panel which doesn’t rely on the term Tier-1 in order to appeal. Selecting a reputable manufacturer endorsed solar installer. Note: Selecting a technically trusted, manufacturer endorsed solar installer initially can often assist toward better solar panel selection and assurance. Manufacturers with extensive Electroluminescence (EL) imaging procedures within the quality control chain ensure damage is arrested before a solar module is released to the field. Selecting a solar panel manufacturer with an esteemed reputation and excessive EL testing throughout the manufacturing process ensures the solar module you’ve selected remains hot spot free. Installer. After selecting the right solar panel, it all hinges on the intelligent solar installer. The installers job is to advise on adverse factors which could affect a healthy solar panel operation, as listed in the causes section above. Reputable installers will always provide a maintenance and care package to assist in managing certain environmental factors which can cause solar panel hot spot in the future. As they say, prevention is the best cure! DIY Hot Spot Detection: Infrared cameras are becoming widely available in multiple forms such as simple iPhone attachments. An IR image offers a fast and economical method for identifying more severe defects across the full site where several hot spots can show more extensive cell damage. Got feedback or a question? Then leave it below in the comments section. The Solar Review community is super responsive. 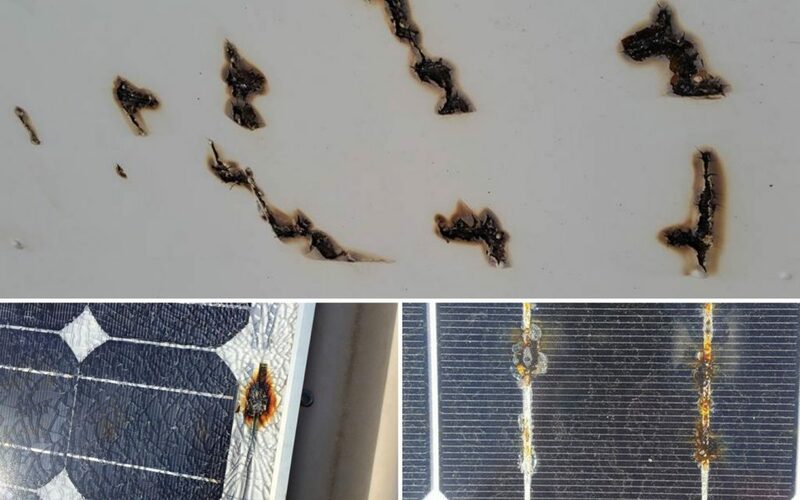 Previous articleSolar Panel Micro Cracks (Tier-1) Exposed! 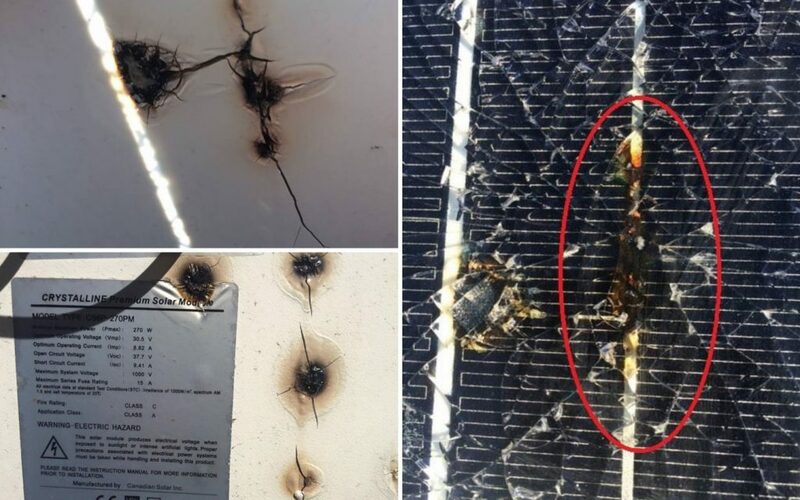 Next articleSolar Panel Fires (Tier-1) Exposed! Solar Panel Shattering (Tier-1) Exposed!